A property investor contacted Tile Doctor to see if we could help renovate a property that was to be sold in few weeks’ time. 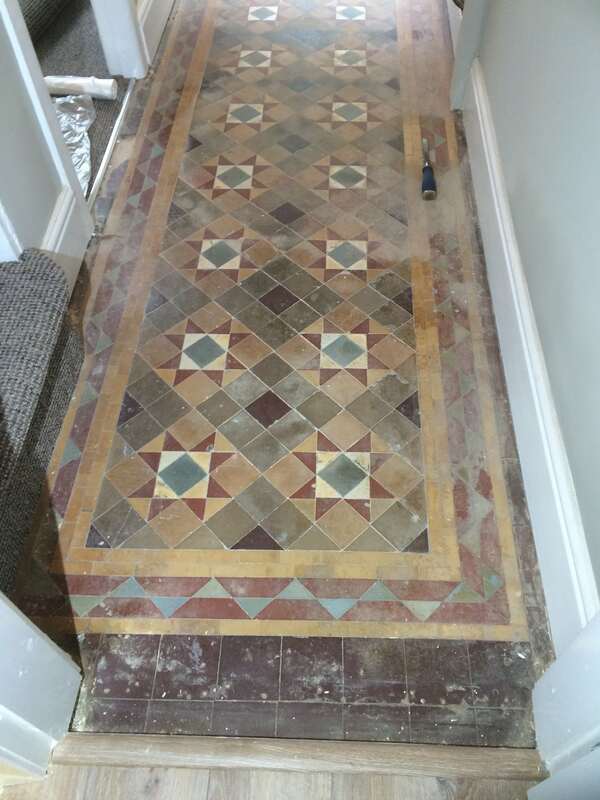 To get maximum value from the investment she wanted to preserve the character and period features of the house including the Victorian Tiled Hallway floor, which as you can see from the photograph below was in need a bit of TLC!. Victorian tiled floors and other period features have become very popular in recent years and are often discovered under hallway carpets covered in years of dirt. Fortunately, they are very resilient and with the right techniques and products can be restored back to their former glory. On our initial visit I conducted a survey of the floor to check its condition and work out the most suitable products and methods to employ to restore it. One of the main concerns we have with these old floors is damp as damp-proof membranes were not invented until relatively recently. I have a damp meter to check for this and it did indicate high moisture levels which isn’t really an issue for cleaning the floor but would restrict our choice of sealer to those which are fully breathable and allow moisture to rise-up through the tile. We agreed a price and schedule with the customer and within two weeks we were able to start the work. The floor was in quite a state, made worse I suspect by recent restoration work by other contractors who unfortunately didn’t take as much care with the floor as the could have done. After protecting the skirting boards and carpets with film work got underway starting by applying a strong dilution of Tile Doctor Remove and Go to the floor to strip away old sealers and other coatings. This product also helps to break down the paint stains on the surface of the tile, though I also used a handheld scraper, as well as a rotary machine fitted with a black scrubbing pad, to speed up the process. The resultant slurry was rinsed off the floor with water and extracted using a wet vacuum. With the floor clean of coatings, the next step was to deep clean the tiles with a medium dilution of Tile Doctor Pro-Clean which is an effective Tile and Grout cleaning product that deeply cleans away ingrained stains. Again, we used a black scrubbing pad fitted to a rotary machine to make the job easier. Corners were tough to tackle with a machine, so we had to do them by hand. The floor was given a final rinse to remove any soil and trace of cleaning product and the wet vacuum was used a final time to extract as much moisture out of the floor as possible. Upon finishing the cleaning, we left the floor for a few days, so it could dry out fully. When we came back to seal the floor we noticed problems with white salt deposits coming to the surface of the tile a problem known as efflorescence. I had suspected this might become an issue but there was no indication of it happening before so was not overly concerned at the time. However, it meant I could not seal the floor as planned until the efflorescence had been dealt with. Fortunately salts like these can be treated and to resolve the problem I gave the floor a wipe with a solution of Tile Doctor Acid Gel which is a blend of phosphoric and hydrochloric acids in a gel form, formulated to remove grout haze (grout smears) and treat efflorescence. Once this was done the floor was given a light rinse and dried again. I left the floor to dry again for a few more days and on my return, I was pleased to see the problem had not resurfaced and I was able to complete the restoration with the application of a sealer. To seal the tiles, I used a couple of coats of Tile Doctor Colour Grow, which is a penetrating sealer designed to soak into the pores of the clay thus preventing dirt from becoming ingrained whilst additionally enhancing the colours in the tile. The sealer really deepened the colours in the tile bringing them to life and with Colour Grow being fully breathable there shouldn’t be any issues with damp becoming trapped under the tile and causing issues later. The customer was delighted with the results (see feedback below) and the work we did should more than pay for itself when the house goes on the market. 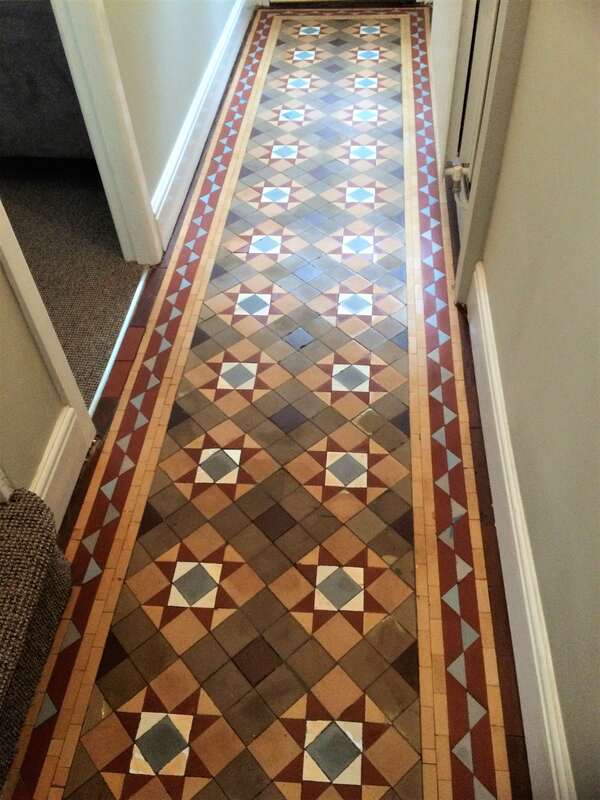 This entry was posted in Burnley, Burnley Tile Cleaning, Burnley Tile Restoration, Burnley Tile Sealing, efflorescence, Lancashire, Property Investor, renovation, Tile Cleaning Activities, Victorian Tile Cleaning, Victorian Tile Restoration, Victorian Tile Sealing, Work History by TileProf. Bookmark the permalink.